Huge Savings Item! 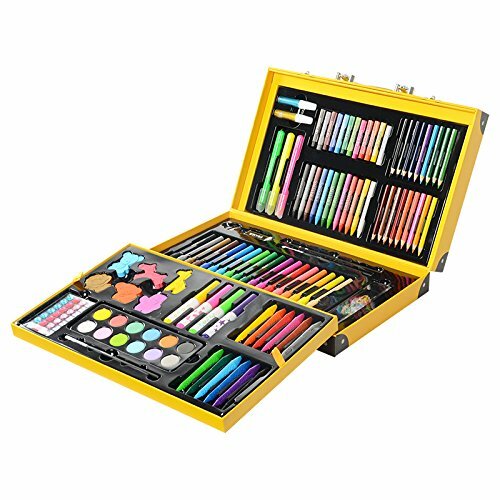 Save 15% on the KIDDYCOLOR Deluxe Art Set for Kids 159 Piece with DIY Suitcase,Colored pencils Crayons,Painting by KIDDYCOLOR at Designers Artists. MPN: KIDDYCOLOR-12. Hurry! Limited time offer. Offer valid only while supplies last. 159 Piece Deluxe Art Set in DIY Paper CaseLet's start at the outside and work inwards. The outer shell is a sturdy, glossy, creative DIY paper case. Let's start at the outside and work inwards. The outer shell is a sturdy, glossy, creative DIY paper case. It's secured with high-quality snap-fit design.And with cute animal stickers for children ,friends to do DIY decoration to create the special case for their own. The inner molded plastic shell is designed so that each of these tools sits in its own neat space. Each crayon, pencil, and marker rests comfortably in a snug holder, elevated away from the base. This elevation allows the artist to remove each tool from its respective space effortlessly: Simply pushing down on one end causes the other end to teeter-totter upwards, enabling easy access. It's so easy to remove each coloring tool and so easy to put them back that it's a snap to keep this set organized. You can have all the art tools you need whenever and wherever inspiration strikes with the KIDDYCOLOR Art Case. Crayons, pencils, markers, and paper are neatly packed into a durable carrying case. So no matter where you are, you can have a whole art studio at your fingertips. Great for birthdays and holidays, the KIDDYCOLOR Art Case allows you to give the gift of imagination and creativity to your favorite little artist. This set also makes a great companion for family vacations. CARRYING CASE:Keep your art materials organized at home, school or anywhere in the sturdy Snap-fit design paper DIY case. The best price in 2017 for Cyber Monday. CREATIVITY SET INCLUDES:18 watercolor pens,18 colored pencils,12 oil pastels,12 crayons,12 watercolor cakes,28 crystal stickers,12 plastic crayons,6 crayons with animals-shape cookies,4 stamp watercolor pens,3 fluorescent silky crayons,24 clips,2 glitter glues,2 painting brush,1 plastic ruler,1 pencil,1 pencil sharpener,1 small eraser,1 sticker. COLORING MATERIALS - this great art set includes all types of coloring and drawing materials for artists of all ages - especially for children and beginners. CUTE STICKER: A good gift for children ,friends to do DIY decoration. This diy creative ideas will inspire kids to do some craft during the day and enjoy while they're doing it. DELUXE PAINTING SET is the ultimate luxury - the beautiful paper case includes all the tools and colors necessary bring creative ideas to life - All stored in a creative DIY case to keep items secure so you can create art wherever you go. If you have any questions about this product by KIDDYCOLOR, contact us by completing and submitting the form below. If you are looking for a specif part number, please include it with your message.